Are you in search of some fun, colorful unicorn treats but are not looking to spend hours in the kitchen? 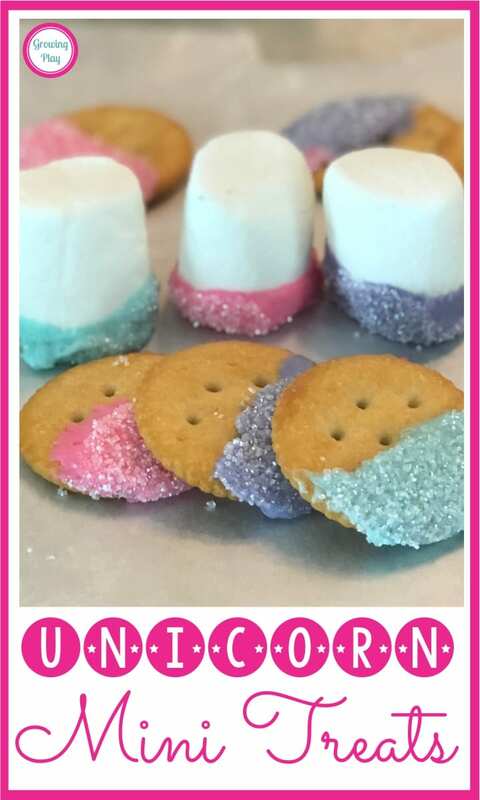 Maybe you are planning a unicorn party and need some unicorn snacks in a hurry. Here are DIY unicorn treats that are cheap and simple to create and you don’t even need to cook them! 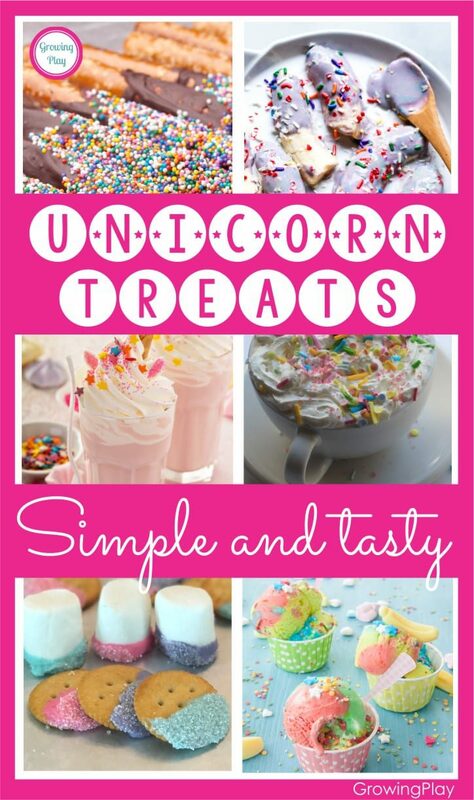 This first unicorn treat is so super simple and easy. Find a white mug and make some hot cocoa. 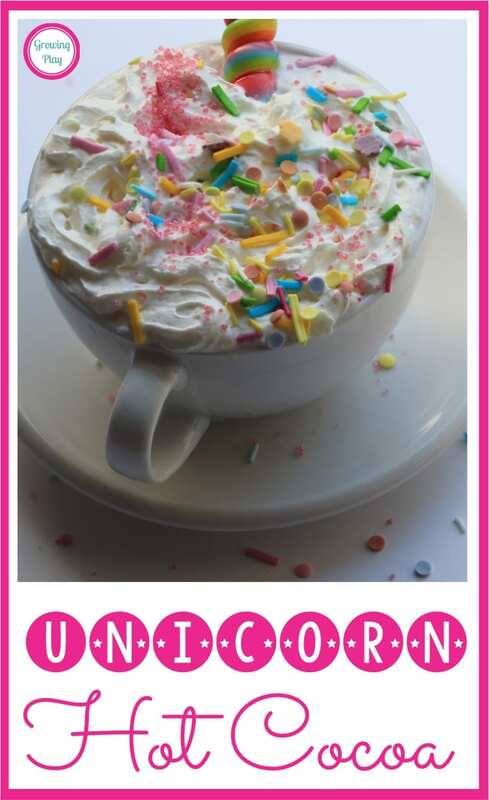 Add whipped cream, sprinkles and a long thin cookie or lollipop to stir the hot cocoa. How easy is that? 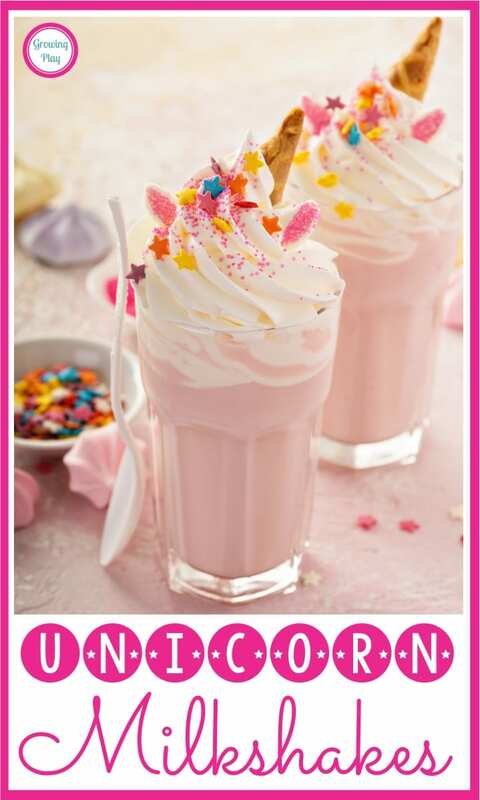 Next up is Unicorn Milkshakes. Maybe it is a summer unicorn party and hot cocoa would be brutal! These strawberry unicorn themed treats are just as simple as the hot cocoa. You will need two scoops of strawberry ice cream, 1/2 cup of milk, whipped cream and sprinkles. 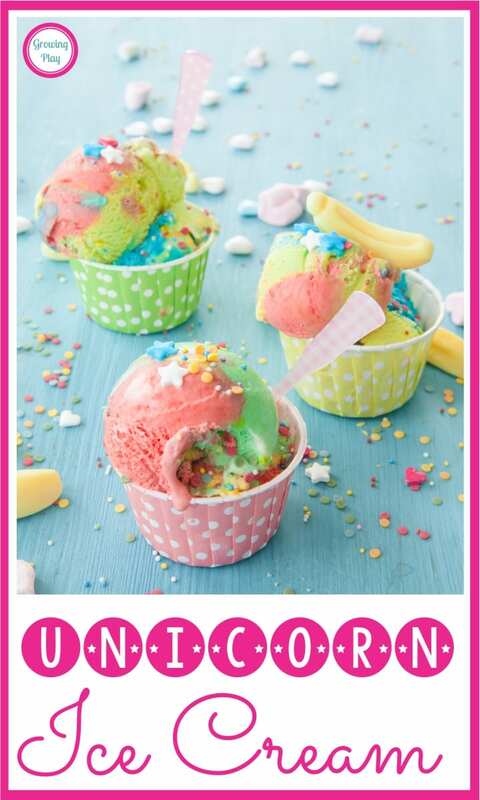 Easy peasy DIY unicorn treat for a hot summer day or birthday party. 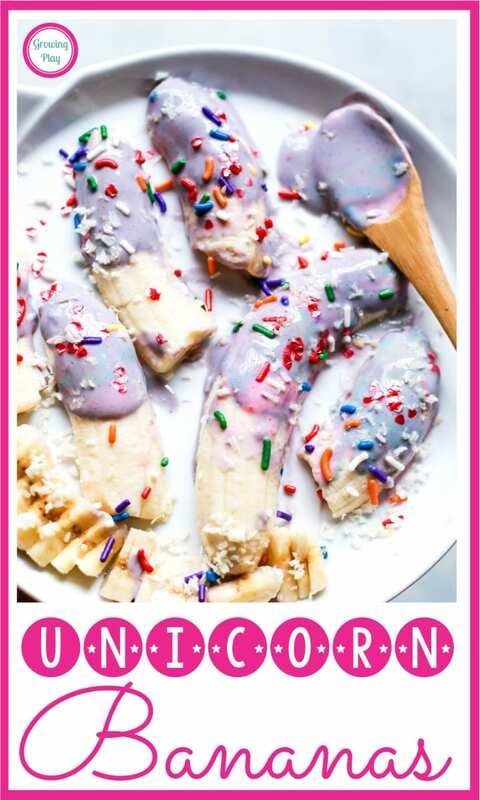 This is the one “healthy” unicorn treat – frozen bananas. Melt white chocolate and add some purple or pink food coloring. Another option is to get purple candy melts. Dip bananas in the melted chocolate, cover them in colorful sprinkles and freeze them. Your unicorn sweet treats are ready to go! This one is probably the easiest of all of the unicorn treats. Scoop rainbow sherbet into small dishes, add sprinkles, and serve. You could get colorful paper dishes and spoons to jazz it up but regular bowls are fine too! Vanilla wafer cookies would make a nice addition as a unicorn horn. The next unicorn treat DIY is pretzel rods. Melt chocolate, dip pretzels in the chocolate and roll it in sprinkles. Place it on wax paper to cool. Stand them up in a tall glass to make pretty decorations at a unicorn birthday party. 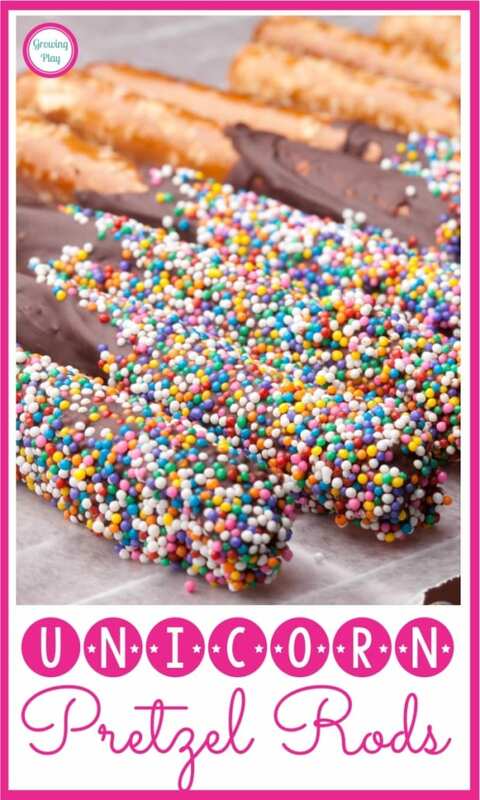 This salty and sweet unicorn treat is sure to please all the unicorn lovers. If you are looking for a tasty unicorn themed dessert, check out these kid created unicorn treats. They are so simple to make and all ages enjoy eating them. I don’t always love super sweet desserts and the cracker cookies are a great combination of salty and sweet chocolate. The marshmallows are on the sweeter side for sure but low in calories. Gather the ingredients. We used Ritz crackers, marshmallows, white chocolate chips, and sprinkles. You will also need food coloring, wax paper, small bowls and a baking sheet. Melt the white chocolate chips in the microwave and separate into three separate small bowls. Add in the food coloring and stir. Start with the marshmallows. Take one and dip into the colored white chocolate followed by the sprinkles. Place on the wax paper on the baking sheet. Next, do the crackers. Dip one side into the white chocolate followed by the sprinkles and place on the baking sheet with the waxed paper. When you are all done, place in the freezer for 15 minutes. Store in an airtight container in the refrigerator. 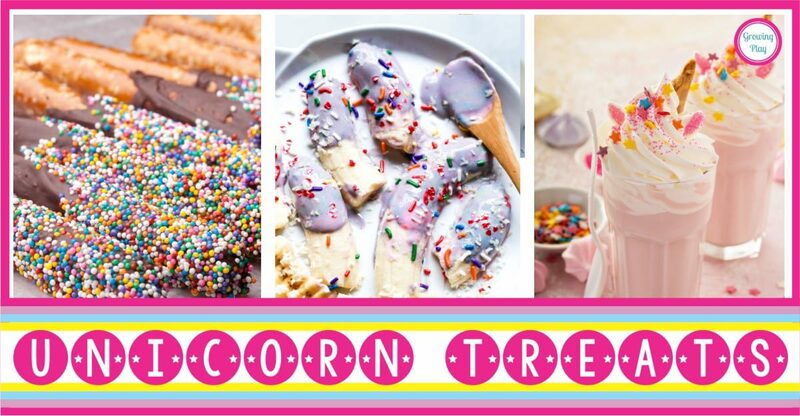 What unicorn themed treat will you create at your next unicorn party? Heck who needs a party! Unicorn sweets are lovely anytime to put a smile on someone’s face.